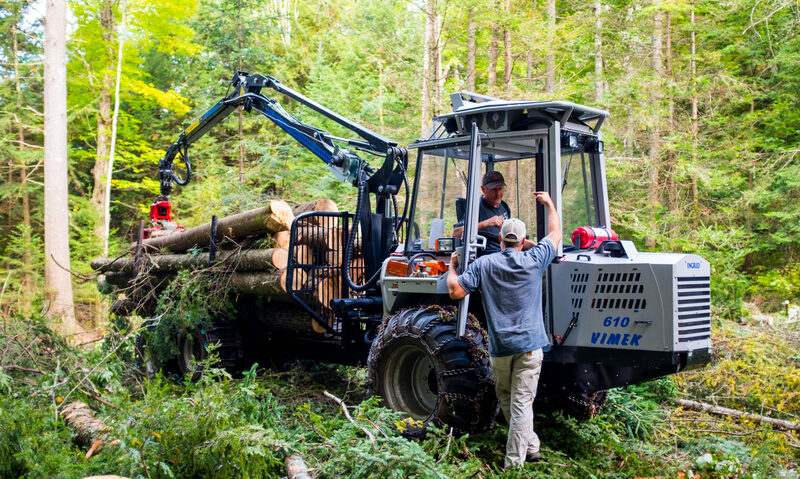 For six generations, the Currier family has been sustainably harvesting several hundred acres of well-managed forests. This ethic of environmental stewardship has yielded a diversity of native tree species that will be sustainable for the next six generations. Walking on these floors will feel authentically beautiful. Tamarack wood is known for being tough and durable, as well as rot-resistant. This is why we offer it as a distinctive wood flooring, with beautiful swirling designs and rich tones. 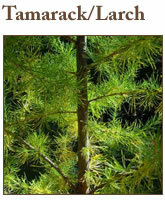 Tamarack (Eastern larch) grows in our wet spots. It is such a gracefully stunning tree in the fall, among the few conifers that loose their needles in the winter. Here, in the Northeast Kingdom, it dots our landscape, especially around our marshes and ponds with a vibrant yellow/orange that displays its nobility. Butternut is a softer, coarse-grained, rot-resistant hard wood which is highlighted exquisitely with stains and finishes. Often used in premier furniture, this flooring adds a warmth to any room. 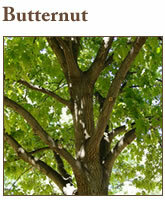 The Butternut tree is a species of walnut native to the eastern U.S., primarily known for its oily rich nuts. Although decreasing in population size, we still have healthy thriving stands in our forests. 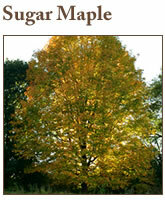 Sugar Maple is one of the most prominent native trees in our northern forest. Known for its glorious colors in the fall, flooring from a sugar maple is just as stunning. Naturally light-colored, this wood can be stained with a wide variety of tones to match any decor. 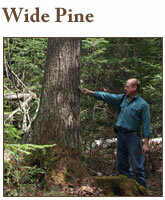 And the hardness and durability of maple ensure that it will last for generations. Sugar maple is an ideal flooring choice for high traffic areas. Taphole Maple boards tell a delicious story. 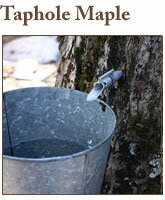 In the process of making maple syrup, sugar maples trees are tapped with a small spout to collect the maple sap. The sap drips out of these drilled holes and is then boiled in a “sugar house” to produce our outstanding Vermont Maple Syrup. Tapping does not hurt the tree, but it does make for some beautiful grains and shows the character of the tree when it grew around the embedded taps. This premium product has the same durable qualities as sugar maple flooring, but can be used for that specialty room as a conversation starter. Eastern white pine is grown exclusively in the northeast and has been used as wide plank flooring since the colonial times. Here in the cold northern climate, white pine trees grow slowly to create a smooth grain, beautiful knots and an amber color that can take a versatility of finishes. We allow our pines to reach a width of grandeur before harvesting, to provide you with a distinctive look of open and spacious luxury. 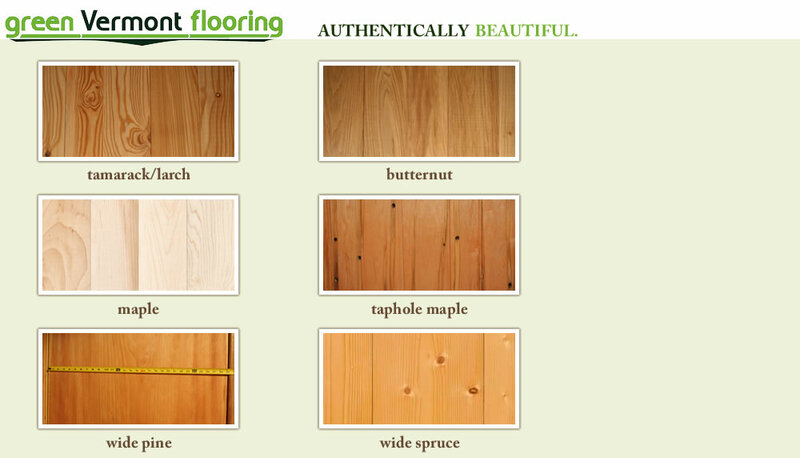 Bring warmth and grace to your room with sustainably harvested white pine flooring. Vermont spruce trees are often used as Christmas trees, but when grown to maturity and harvested for wide plank flooring, they take on a whole new presence. Spruce is an open grain, light colored wood with knots that create a unique rustic appearance. 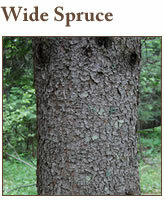 Native to New England, spruce is environmentally friendly. It grows very quickly and can keep up with the pace of demand. Spruce is a softwood and can dent over time, but it is also very durable and will age with distinction.